Heading from Helen on 75 north towards Hiawassee from there taking 69 and 64 towards Marble, NC. From there we will continue on 74 and 29 towards Robbinsville. Just a few miles north we will stop for lunch at Tapoco Tavern. After lunch, we continue on 129 north towards Deals Gap. If traffic is clear we will stay on and enter the famous "Tail of the Dragon". This windy road contains 317 turns in just about 8 miles. Once we leave the "Dragon" we will continue for another 4 miles before making a u-turn to go back over the Dragon. 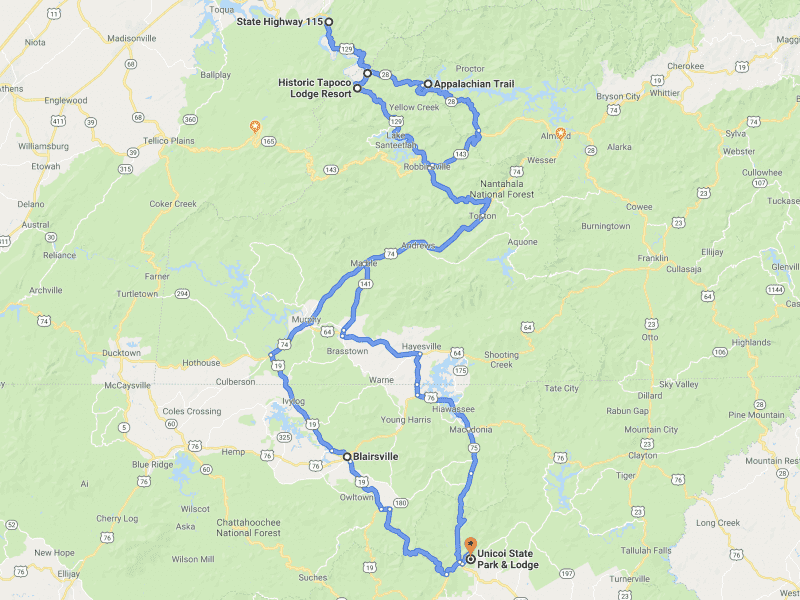 We will make a quick stop at Deals Gap before continuing on 28 east on the so-called "Hellbender". At the base of Fontana Dam we will stop briefly for a group picture before we continue on 28 east back towards Robbinsville. One last restroom stop from there we will head back south on 129 and 74 towards Murphy, NC. We will continue on 19 south back to Blairsville, GA than for the final stretch taking 348 south towards Helen. A long day full of turns and fun driving. It is a spirited drive and recommended for experienced drivers with previous Audi Club experience on spirited drives.